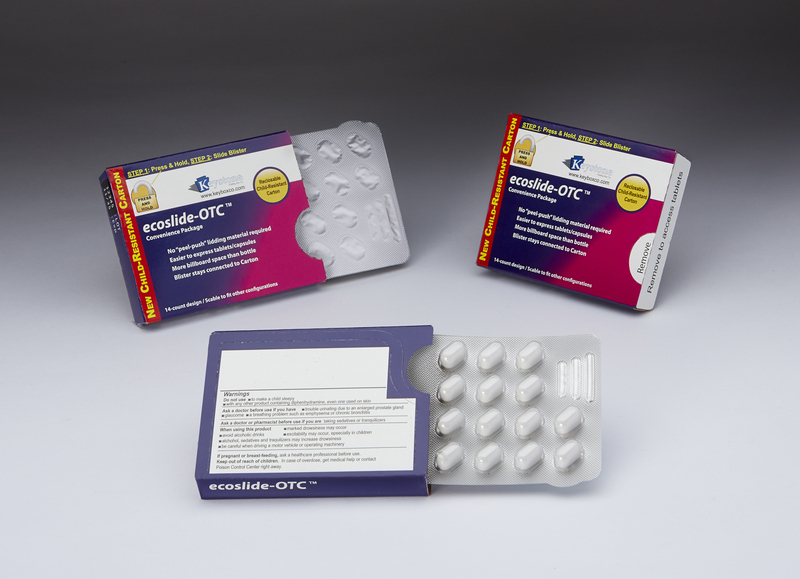 Keystone Folding Box Co., a designer and cGMP manufacturer of paperboard packaging solutions, has launched Ecoslide-OTC, a child-resistant paperboard pack for over-the-counter medication packaged in blisters. Debuting at NACDS Total Store Expo, August 19-22 in San Diego, the innovative, eco-friendly solution features a push-button locking mechanism that provides child-resistance while eliminating the need for the more traditional, two-step “peel/push-through foil” that many consumers find difficult to open. The Ecoslide-OTC re-closable locking mechanism is identical to a newly-enhanced, easier-to-activate version found on the company’s new Ecoslide-RX 3.0 package. Ecoslide-RX, which has consistently achieved the highest child resistance rating (F=1) through multiple tests and gained widespread consumer acceptance, is used to package both clinical trial material and commercial prescription products. Similarly, Ecoslide-OTC’s simple push-button re-closable locking mechanism addresses long-standing consumer complaints about the intricate, often cumbersome removal process required by most over-the-counter, “peel and push” child-resistant blister packs. Ecoslide-OTC has been identified in consumer research as both conveniently sized and easy to open — benefits further enhanced by the increased area to print information or illustrations (when compared to similar-sized bottles). In developing Ecoslide OTC, Keystone Folding Box Co. worked closely with prominent contract packagers, who are now reporting growing requests from major retail chains for new and innovative approaches to child-resistant OTC packaging. True to its name, Ecoslide-OTC is made from 100% recyclable paperboard. It is easily separated from its internal blister for recycling; the blister is disposed of, but contains only a fraction of disposable plastic when compared to bottles. The challenge with recycling traditional prescription medicine bottles is that most curbside programs do not accept them. According to the Association of Plastic Recyclers (APR), prescription bottles smaller than 3˝ in all directions will not be recycled, and ultimately become landfill waste. Source: Keystone Folding Box Co. The preceding press release was provided by a company unaffiliated with packagePRINTING. The views expressed within do not directly reflect the thoughts or opinions of packagePRINTING.